Pavlova is one of those desserts that never fails to please, young and old alike. A sweet that has been high on my dessert menu since I was a child and I can’t even begin to think of how many egg whites I have whisked up over the years! My mother always made pavlova for her dinner parties and as kids we would eagerly wait for the return of the pavlova from the dining room, hoping that some would be left…most of the time, none! However, pavlova was made on many other occasions, much to our delight. When my children come back from university for the holidays, pavlova is always one of their requests. This pavlova post is part of the Great Australian Pavlova Blog Hop. As I have been making this dessert for many years and have tried recipes with the addition of cornflour (keeping the center soft), vinegar, pinches of salt or cream of tartar (stabilization), I have come to the conclusion that… I can make a successful pavlova (crisp on the outside and marshmallowy in the middle) with just the egg whites and sugar… it works for me! Preheat the oven to 275F/Gas mark 1/130C Fan. With a pencil or marker draw 12 2” inch circles onto baking parchment and lay (marked side down) onto a lightly greased baking tray. In a medium bowl, beat the egg whites with an electric whisk on high-speed until soft peaks form. Gradually add the castor sugar a little at a time (heaped tablespoon) and continue to whisk until all the sugar has been incorporated and dissolved with the egg white. After about 10 minutes whisking, the mixture should be smooth, shiny and holds very firm points on the whisk when you lift it out of the mixture. Either spoon or pipe ( piping bag with a plain nozzle) the mixture onto the traced circles, using a palette knife to level the top and smooth the sides. Place the baking tray into the oven and bake for about 1-1/4 hours or until the pavlovas feel dry to touch and peel easily from the baking parchment. Turn off the oven and let the baked pavlova sit for a further 15 minutes in the oven with the door propped open with the handle of a wooden spoon. Remove the pavlovas from the oven and leave to cool completely on wire cooling racks. Some may crack, do not worry as it only adds to their charm. Once cooled they can be placed into an airtight container and stored in the fridge for a couple of days before topping with cream and fruit. A few hours before serving, pour the cream into a bowl and sieve in the icing sugar. 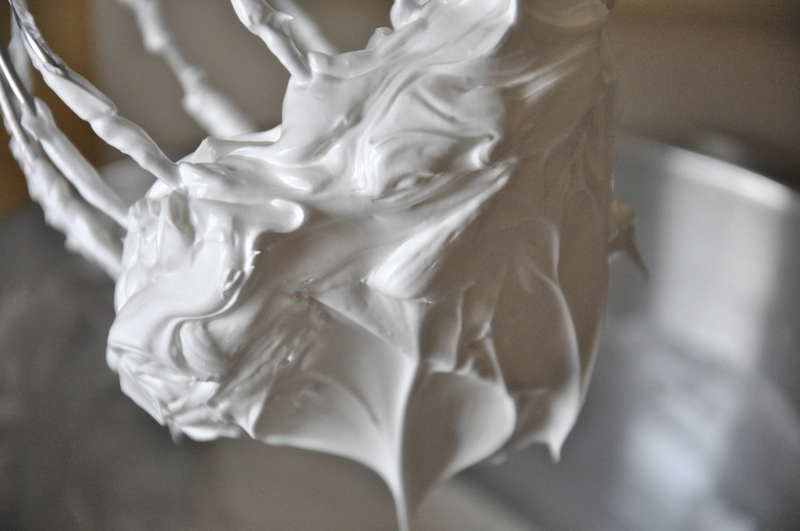 Using an electric whisk, whisk the cream until it holds soft peaks. Add the rose-water, folding into the cream using a spatula. 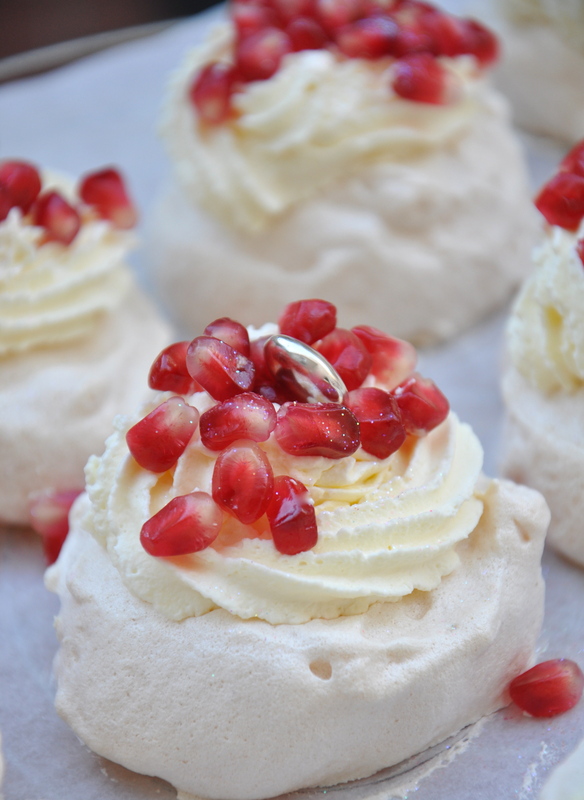 Top each mini pavlova with some cream and scatter over the pomegranate seeds. Place a silver degrees on top and dust over some edible glitter. Cover and place in the fridge until needed. Do not let any part of the yolk enter into the whites or the egg whites will not whisk successfully. Use castor sugar, not granulated. Check your oven is at the correct temperature using an oven thermometer. Your pavlovas look so beautiful!! I love the rose scented cream and the pomegranate topping. Thanks again for participating in the Great Australian Pavlova Blog Hop!! What a beautiful pavlova! 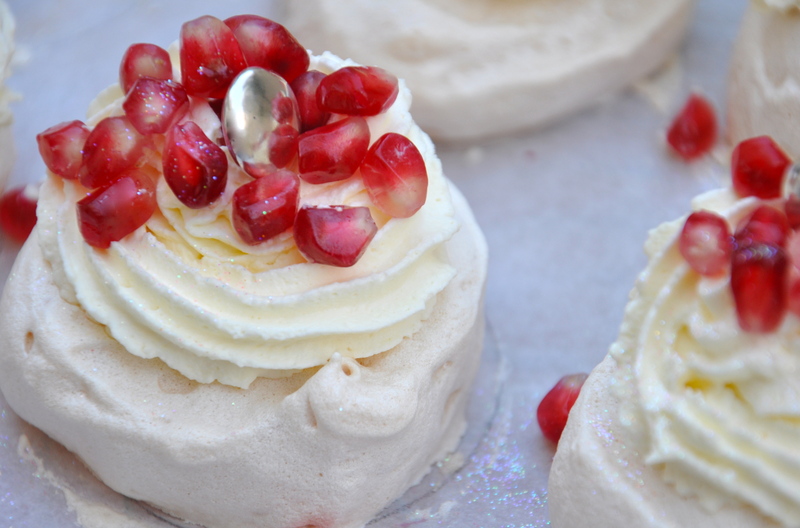 The pomegranate and silver topping looks so pretty and I can just imagine how lovely the rose cream would be. How clever are you! I love the photos of the stiff uncooked meringue, too. So happy you joined us in this blog hop! These look absolutely beautiful – the pomegranate looks like little jewels on top of their soft, creamy pillows! That is exquisite. I love the idea of the pomegranate! The use of pomegranate is inspired, so pretty! 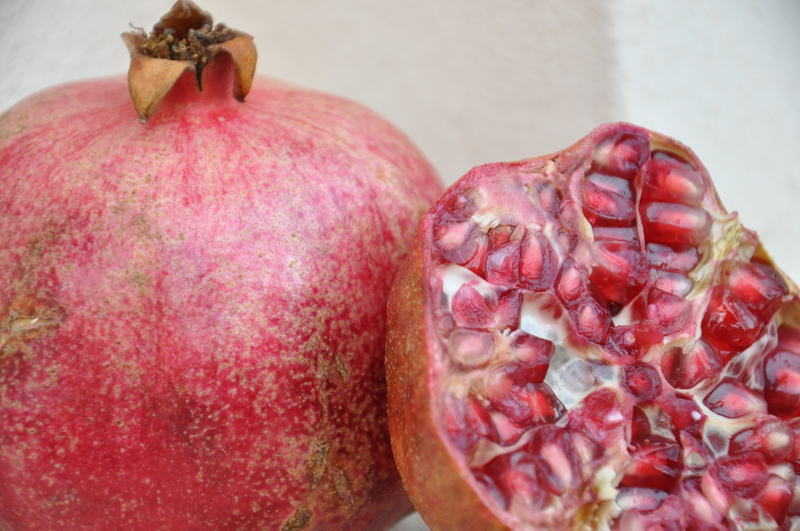 mmmmm… I love pomegranate. I love how it pops in my mouth and I can imagine the contrasting texture of the marshmallowy pavlova with the pomegranates in one bite! Where do you get edible glitter. It looks pretty classy not like the fluro coloured stuff I’ve picked up in Woolies! beautiful! just like a little gem! If you make them Jenny, keep me one! Great combo with the pomegranate, rose and silver – I can’t resist shiny things! And I’m a big fan of the individual serves – then you can get a full quantity of both crunchy and soft in one go. Thanks for joining the hop! I love individual servings as well, it was nice to see all the different pavlovas! i love the styling! the combination of red and white is my favourite. looks very delicious! Ooooh I will have to try your method with just sugar and egg! Amazing. These look delicious. 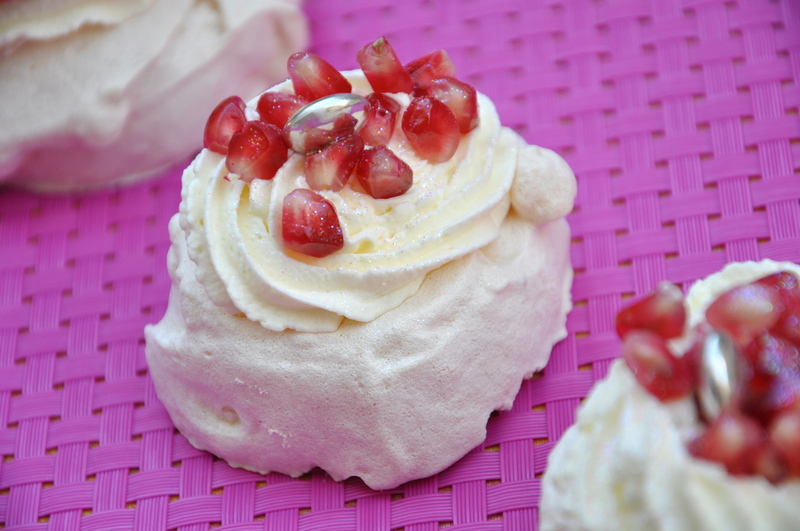 I also made individual pavlovas – they’re so cute! I love pomegranate and the rose adds a nice Middle Eastern flair.